In my previous entry I wrote about wanting to share – in my own words – the importance of body position when sport riding. This is entirely in my words, based on my experience, as though more thorough discussions and illustration can be found all around the internet, maybe you happen to prefer a more abbreviated take. Like say, in 600 words or less? It can be complicated though, and maybe simplifying it too much just won't do the whole concept any justice because it shouldn't be simplified that much. When you are talking about a principle of riding that involves as many components as your physical self has (upper/lower body, head, shoulder, arms, elbow, wrists, hands, legs, etc. ), it's never going to be simple. However, without over-simplifying anything, I'm going to focus on one major focal point in our body that effectively ties them ALL in – your spine. I'm sure the difference(s) in the two photos above are visible to anybody, and while I could pinpoint what differences there are between them, let's focus instead on the rider's spine. 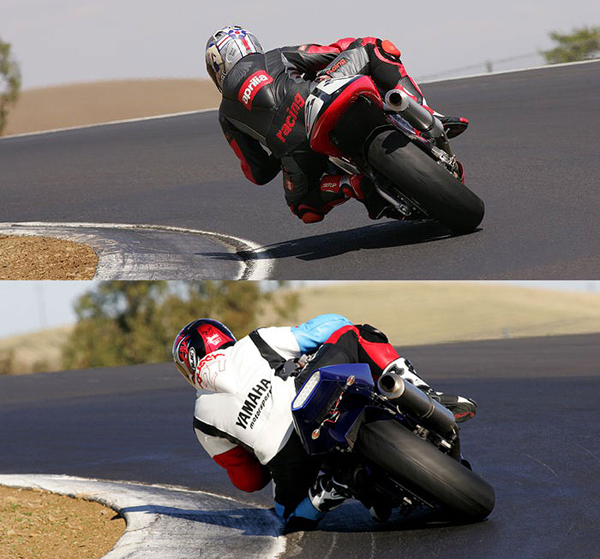 If you can picture an imaginary line through the spine of the rider in each photo, can you see how they would differ? Need a bit of help visualizing? 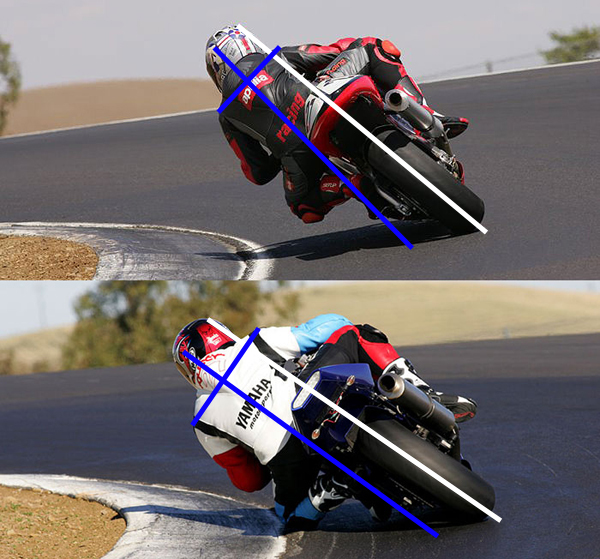 If you can imagine the center line of your motorcycle as illustrated by the white lines above, then this is the point of your bike that you move your body away from to hang off when going through corners. This imaginary line can then help you to move your body in such a way so as to keep your spine as aligned and parallel to the bike's center, keeping your overall frame square on the bike instead of being crossed-up. As the top photo illustrates, being crossed-up makes it seem as if your lower body is doing something that your upper body is reluctant to follow. Now, being crossed-up isn't necessarily a bad thing or an all-inhibiting practice by any means. I certainly wouldn't tell guys like Mick Doohan or Troy Bayliss how they should position themselves on their bike. 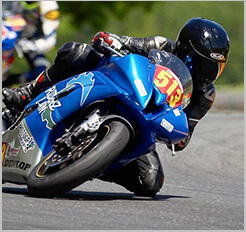 It remains that the first and foremost important piece of advice is to be comfortable on your bike, and be it crossed-up or not, if you're already comfortable, then perhaps you would be better off working on other things to aid your riding. But if you feel as if your body positioning does need work and you don't quite know where to start, I suggest starting with your spine. In body positioning, think of your spine as the core, which in the absence of anything else, serves to hold everything together in their place. Start at the core, and everything else can follow.